View More In Swivels - Page 3. 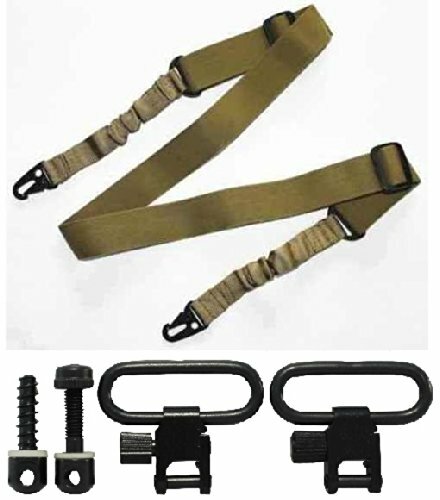 Package Includes: Set of 2 Steel Swivels 1" Wide + Wood Screw Studs 3/4-Inch Screws & 7/8-Inch Machine Screw and Nut for the Forend + Multi Option Bungee Strap. Desert Tan - Premium 1.5" Wide Weatherproof Strap. Superior Quality Metal "QD" Quick Detach Hooks For Multi Operation. High Strength Bungee - Fully Adjustable To Provide Different Lengths For Various Shooting Positions Great For Close Encounter And Battlefield Operation.